NASCAR is an excellent, but under-utilized, outdoor advertising opportunity for advertisers. It is the only national series that consistently draws regional crowds exceeding 200,000 fans per event. Many people don't realize this, but each event typically lasts 3-4 days with the qualifying and race days being the peak time. 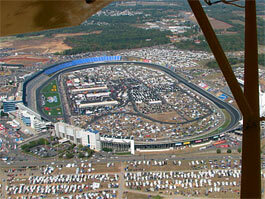 AirSign offers Airplane and Helicopter Banners in addition to Blimps and Skywriting for all NASCAR events. AirSign knows NASCAR better than any other Aerial Advertising Company in the US. How can we say this with confidence? Because we have been flying over NASCAR events since 1996, when the Sprint Cup was still called WINSTON CUP and the races were run at obscure speedways that have since been dropped from the schedule entirely. We know the events to cover, and most importantly, we know the best way to cover them. If you have been at a race over the past 10+ years, chances are good that you have seen at least one of our signs in the air. Look for us at the next race! Bookings for aerial letter banner flights can be taken up until the day before the flight. 2017 NASCAR SCHEDULE - Book now for the next race! At AirSign we take the time to understand our clients goals and objectives for a campaign and then use our experience and market intelligence in putting together a proposal that will exceed their expectations. Much more than a vender client relationship, we do the research to ensure the optimal markets, prime advertising times, and correct media is used to maximize the return on investment. Contact our team for more information on how we can partner with you in making your advertising campaign a fun and rewarding experience your audience will remember.